While I first came across Neighbourhood Coffee at Cup North, I already knew of Ed and Chris through a mutual friend, Robert Leigh, author of From Lime Street to Yirgacheffe. Rob, who used to work with Ed and Chris, was the one who alerted me to Neighbourhood in the first place. Ironically, although working as a coffee trader, Chris never saw the beans he was importing since they went directly to a warehouse in the middle of England (Ed spent 18 months at origin in Ethiopia, so has a slightly different story!). Chris’s moment of inspiration came in Liverpool’s Bold Street Coffee where he drank, for the first time, a coffee that he’d traded. Realising that there was a more than just trading green beans, this gave Chris a desire to create something special, which drove both Chris and Ed to leave Schluter and open Neighbourhood. Although Neighbourhood’s only been going for a year, they’ve created something of a splash, partly through their innovating naming. All Neighbourhood’s coffee, single-origins as well as blends, have names, usually puns on song-titles. It might seem a strange strategy, but it works: recently I was giving some coffee away to friends, offering a choice of three bags. The first one off the table was Neighbourhood’s “I Still Haven’t Ground What I’m Looking For”, a single-origin Yirgacheffe, because, in the words of the person who took it “I can’t turn down a pun like that!”. At the moment, Neighbourhood roasts between four and six single-origins, the precise number depending on what green beans are in stock. These in turn are selected largely on taste/quality, Neighbourhood buying beans that Ed and Chris like, rather than aiming for a particular number of single-origins or a balance from specific regions. Neighbourhood roasts two espresso blends, a middle-of-the-road house blend, a mix of Brazilian and Colombian, which was described to me as “forgiving and chocolatey”, and “You’ve Got a Blend in Me”, which is more complex and fruity. 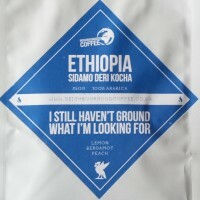 Naturally, this was the one I got to try (having sampled the single-origin pour-overs both at Cup North and at home). In a flat white, I found it very smooth and well-balanced, while the milk was rich and creamy. However, on its own as an espresso, it was very different, the fruitiness of the blend really coming through. Over coffee, we chatted about the challenges of being a small, start-up roaster, variations of which I’ve heard up and down the country. An additional challenge, according to Ed and Chris, is that Liverpool never really discovered third-wave coffee in the way other cities did. So rather than converting customers from chains, they’re often fighting against a culture based on very cheap coffee. Part of winning people over to paying more for their coffee is having a good story to tell (which is where having been green-bean traders and having been to origin helps). The other part is training, since as good as the coffee is, if it’s poorly made, it won’t taste very good. The key here is getting staff involved and motivated, and getting management buy-in. Consistency is a big issue, as well as getting staff to accept a need to continually improve their skills. Once that hurdle has been overcome, the quality of the coffee sells itself. November 2016: Neighbourhood Coffee now has a range of speciality coffee in capsules which was launched at the Manchester Coffee Festival. December 2016: Neighbourhood Coffee was a runner-up for the 2016 Best Roaster/Retailer Award. Liked this Coffee Spot? Then check out the rest of Liverpool’s speciality coffee scene with the Coffee Spot Guide to Liverpool. This entry was posted in Liverpool, Meet The Roaster, Roastery and tagged include by Brian Williams. Bookmark the permalink.